How can women be integrated in processes of democratisation? The participation of women in political and economic processes is essential for democratic governance. The PROWID grants system supported activities such as lobbying and advocacy, skills development and developing institutions to further women's social and economic rights. This report looks at women's participation in political culture, civil society and government institutions. Importantly, it puts participation in the context of shifting gender (and other) roles and identities. It acknowledges that such shifts can allow for women in particular to develop new skills and access new rights. 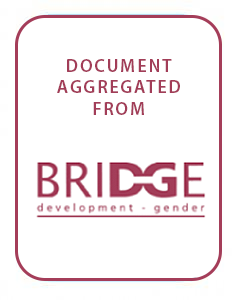 Concepts and definitions of gendered participation are illustrated through examples from PROWID's projects. The report recommends the development of tools and strategies to support policy analysis and build skills through, for example, legal and human rights training, political education for women and support for lobbying. It also illustrates how collective empowerment can be supported through facilitation of networks and bringing different organisations together to exchange ideas. It points out that essential credibility in political arenas can be generated by creating a body of knowledge about women's political participation that might include, among other things, comprehensive gender-disaggregated statistics.